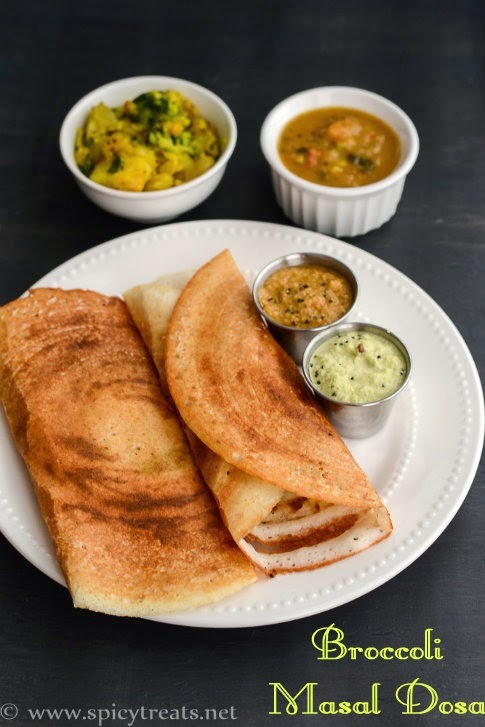 Masala Dosa/Masal dosa is a popular south Indian dish, a thin crispy dosa served with potato masal(sabzi). 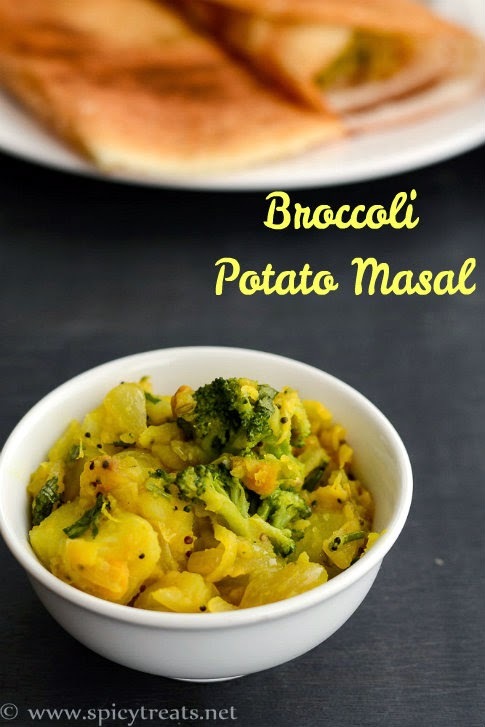 Broccoli Masal is nothing but a usual potato masal(sabzi) with the addition of Broccoli. I love broccoli in any form and I love to cook it the Indian Way more, especially in all possible south Indian dishes. Have tried Broccoli Rasam, Broccoli Kootu, Broccoli Poha Upma and few more recipes. 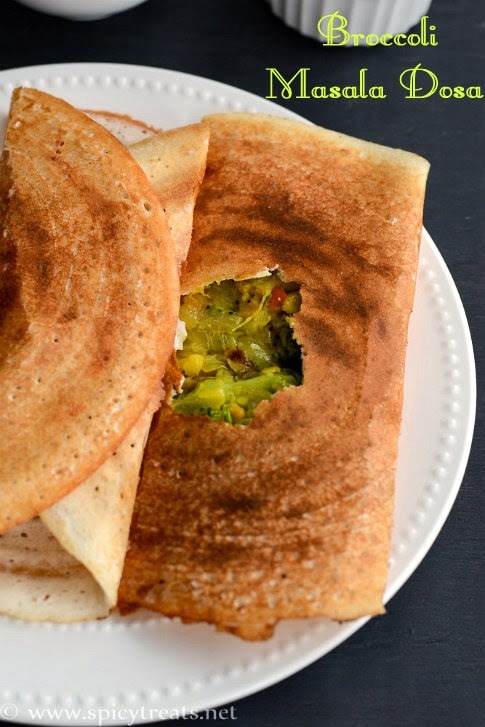 I love stuffed dosa and this broccoli masal dosa is one of my favorite, broccoli pairs well with potato in any form and this Broccoli Masal is another winning recipe. Even if you don't like Broccoli or hesitate to cook broccoli, don't worry, you can cook it along with any of your favorite dish or vegetable. Potato is one of our family's favorite vegetable, I tried more recipes with Broccoli & Potato combo. Also, Broccoli goes well with Indian spices,I have tried lot of recipes the Indian Way. I prefer Indian Cooking more than any other cuisines, cooking with spices is my favorite. We eat breakfast either idlis or rotis or upma or pongal, even bread and milk and sometimes for weekends I cook elaborate meal for breakfast and Last weekend we had such elaborate typical south Indian breakfast- Idli/Dosa/Broccoli Masal Dosa with 2 chutneys & sambar. I have already posted this Broccoli Masala Dosa long back. But re-visiting few of my old posts with new pictures and step wise pictures. There are few interesting and my own recipes which I want to re-post with good pictures, this is one among of my experiment which turned out great and my favorite too. Next time when you make potato masal, don't forget to add some broccoli florets and let me know how it turned out to you. Oil or ghee as needed to toast dosa. Boil the potatoes ,peel the skin and mash them roughly and keep aside. Heat oil in a pan,add mustard seeds and fennel seeds wait till it pop, and then add the soaked n drained chana dal fry lightly and add crushed garlic,chopped ginger,curry leaves,green chillies & saute for few seconds. And add sliced onions, saute till onions turns soft but not golden brown, onion needs to be crunchy..so saute for 3 minutes and then add chopped tomatoes and saute till mushy. Now add the broccoli florets and turmeric powder, give a nice stir and then cook covered for 4-5 minutes until broccoli gets soft and tender. After that add boiled and mashed potatoes ,enough salt and mix everything well and saute for 1 minute. And then add the chana soaked left over water and cook covered for few minutes. Lastly add some finely chopped cilantro, mix well and turn off the stove. That's it..Broccoli Potato Masal ready to make Masala Dosa. Heat a tawa,when it gets hot... pour a ladle ful of batter and spread in circular motion..make it thin crepes. Drizzle some oil and cover the dosa with lid and cook for 30-35 seconds and open the lid and cook till turns crisp then Keep 2-3 tbsp full of Broccoli Potato masal in the center. Then fold the both edges of the dosa or make a fold like triangle shape and remove from the tawa and serve hot with Chutney & Sambar or as such. I served with Coconut Chutney, Kadamba Chutney & Instant Sambar. You can use fresh or frozen broccoli florets. If using fresh, you can also blanch it before using it in the recipe. To Blanch - Bring 2-3 cups of water to boil rigorously, then to the boiling water add broccoli florets and cook for 2 minutes. Then drain the florets using strainer and wash it in cold water and drain well. Using soaked chana dal gives nice soft chana dal and taste to masal. You can add more water or cook it without water, adjust masal consistency to your choice. You can also serve this Broccoli Potato Masal with Pooris & Chapathi or Phulka too. healthy and filling stuffing.. yum! 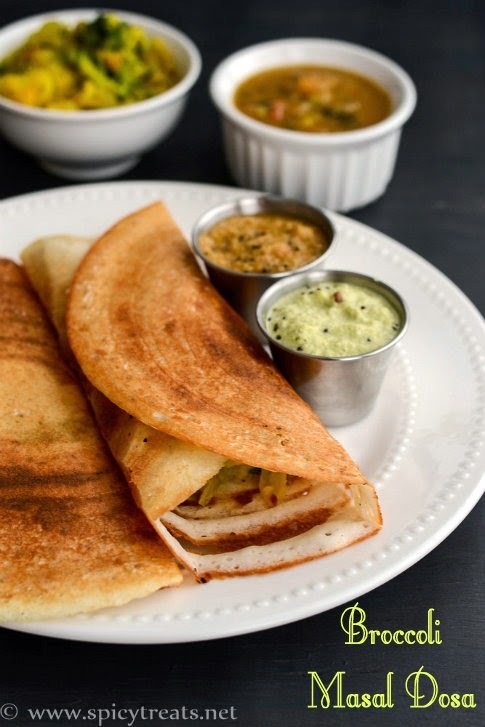 Love the addition of broccoli to the masala.. crispy and tempting dosas..
A nice twist to traditional masala dosa...Dosa looks super crispy with delicious filling..Yum!!! That sounds not just delicious, its very healthy too. 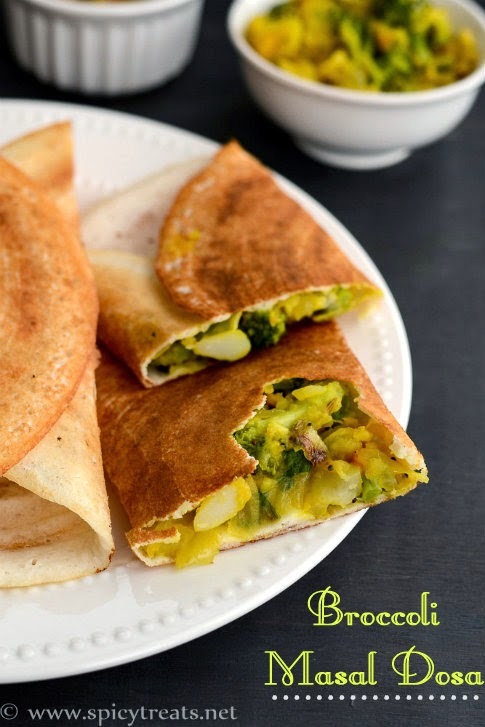 crispy n perfectly made dosas,looks yummy with broccoli filling! !